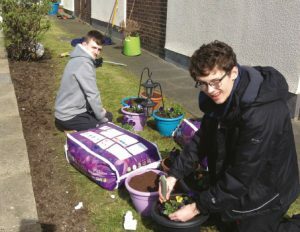 Two members of 16th Newtownabbey Company, Jordan McClelland and Glenn Lennox went out into their local community to make a difference. The lads got involved in digging over beds and making up planters at Clonmore House Care Home in Rathcoole. All the plants were donated by Homebase and B&Q. Visitors and residents alike can now enjoy the wonderful show of colour.